Q: Marc, what inspired your to write Where’s the Ivy? Where does this story come from? A: Many years ago, someone had read a brief article I had written for my company’s newsletter and told me, “Hey, you can really write.” Then I thought, maybe I can. I started making notes of interesting things I encountered or heard, and I started reading more. On weekend mornings while enjoying my coffee, I would read. That would inspire me to try my hand at writing. And I wrote. When I began teaching at a community college, I found an environment rich in experiences. I felt like I could use these as foundations for stories and write about them. I built an entirely new environment with its own stories and they became a larger story, then a book. 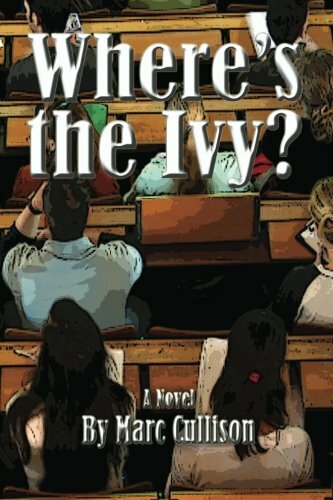 Q: What do you hope readers will take away after reading Where’s the Ivy? A: Feeling good about themselves, and, of course, the satisfaction of being entertained. We all deserve an escape from everyday hassles. Just knowing that it can happen to someone else helps soothe the bite of some of the more caustic episodes in our lives. A more astute reader might discover the message of our failing public education system and the gradual dilution of higher education standards. Q: What does your story say about our current times? A: The story reveals how we baby-boomers might feel toward the younger generations, and the challenges their cultures presents to ours. They can be formidable, and they make us re-evaluate our own worth to society. Sometimes I feel like my generation is obsolete. But then, we present some notable challenges to the younger generations, as well, and I can’t exactly see that they are preparing for any better futures than we are enjoying. I think they might be in for a spot of trouble. Q: Anything else you’d like to talk about? A: When I started this book, publishing was not a serious goal. I just wanted to see where the story led me. It turned out to be educational for me. I’ve learned a lot about our youth by observing and thinking. I hope the reader can find something of value there. And, I hope this book might inspire someone else to write. Available now from Amazon.com, Barnes & Noble, and other bookstores.